In 2013, renowned artist Dan Campanelli and his wife Marty walked into an early planning meeting for Hunterdon County's 300th anniversary celebration. This amazing couple came to offer Dan's talent to aid in fundraising efforts for the 2014 year long event. It is so unusual for someone to actually offer, without being asked, to help raise money by offering the gift of their art and/or themselves. But Dan Campanelli was not the usual sort of person -- when he found a cause he felt strongly about, he was all in. He felt that way about people, too. Dan painted the beautiful watercolor "Blue Skies" for us -- a gorgeous painting of the Hunterdon County Historic Courthouse. Only 300 signed, Limited Edition prints were, or ever will be, produced for sale. Dan and Marty also generously donated the rights to the image to the Hunterdon Tricentennial Committee, now the Hunterdon 300th. The original painting of the Historic Courthouse hangs in the Hunterdon County Justice Complex on the corner of Park Avenue and Capner Street in Flemington Borough. Signed Print Number 1/300 hangs in the Freeholder Meeting Room, both donations by the Hunterdon Tricentennial Committee to the people of Hunterdon County. Dan painting "Blue Skies." Photo courtesy of Marty Campanelli. If that wasn't enough, Dan and Marty opened their beautiful historic home to the Hunterdon Tricentennial Committee for an "art party" fundraiser, gave a talk on their amazing research on Hunterdon historic samplers, and, in 2016, Dan painted 26 small watercolors of his interpretation of some of Hunterdon's 18th century taverns. Marty and he researched the taverns' histories and the set of paintings was turned into a 25 month calendar with the 26th painting as the front cover -- yet another fundraiser for the Hunterdon 300th. The calendar covers all of 2017, 2018 and January, 2019. Poignantly, Marty gave a talk for us last year and read both her and Dan's part as he was in the hospital. Sadly, this was the last project and last paintings he completed. We lost Dan after a more than 18 month fight with cancer. We lost the historian, the artist, and most of all, our friend. Our condolences and love to Marty. A June 25th Memorial to celebrate Dan's life will be held at the Quaker Meeting House in Quakertown at 1 pm. All are welcome. The Limited Edition of "Blue Skies" will never be produced again and once they are sold out, 300 lucky people will own the only signed and numbered prints of this Campanelli. There will never be another printing of either the tavern calendar or "Blue Skies" -- just as there will never be another Dan Campanelli. If you are interested in acquiring either the Limited Edition print of "Blue Skies" or the two year tavern calendar, please contact us at 300info@co.hunterdon.nj.us. Amazingly, we still have a few seats left for our spectacular June 10th bus trip to Revolutionary War Trenton -- Hunterdon's County Seat in 1776! $30 per person includes deluxe coach bus (air conditioned and with rest room); lunch and snacks; entrance fees to the Old Barracks and Trent House; a guided tour around 18th century Revolutionary War sites (both Battles of Trenton, Quaker Friends Meeting House, Historic Churches and graveyards, and the site of the original Hunterdon County Courthouse), two tour guides (Hunterdon County Historian Stephanie Stevens and Old Barracks Executive Director Richard Patterson), and even the tip for the bus driver! For a full description of the event, see our June calendar at www.hunterdon300th.org. JUNE 14th: FLAG DAY: Ever wonder what happened to the flag raised at Ground Zero by the three firemen on 9-11? Or the story behind the Flag of Liberation carried by President Franklin Roosevelt during WWII? Did Betsy Ross in fact make the first flag? And what were the circumstances that led to the writing of our national anthem, the Star Spangled Banner? Not only has the flag traveled to outer space, it has climbed the highest peaks on earth, sailed the seven seas and raised the spirits of our fighting men and women during times of war and military conflict. These and other stories connecting the flag to great moments in the American experience are explored in this PowerPoint presentation that pays tribute to some of our nation’s most famous flags and examines the events surrounding their place in history. Main Branch of the County Library, Route 12, 7 pm. Free with refreshments. SPECIAL ANNOUNCEMENT IN CONJUNCTION WITH FLAG DAY! Each year, Hunterdon County's chapter of the Daughters of the American Revolution, the Old White House - General Frelinghuysen - Colonel Lowrey Chapter, hosts a flag disposal ceremony. This year's ceremony will be held on Saturday, June 17th at 10 am at the DAR Cemetery and Memorial Park on Route 22 at Washington Drive in Whitehouse Station. The public is welcome to attend the ceremony and bring flags for disposal, or flags may be dropped off at the Hunterdon County Library, Headquarters Branch, Route 12 and the Flemington United Methodist Church from June 4th thru June 14th. JUNE 27: MUSIC FOR ABRAHAM LINCOLN: In period dress, Ridley and Anne Enslow will perform historic music about Abraham Lincoln, including campaign songs, Civil War tunes, and laments written on the passing of this great American president. The Enslow's will sing and play with instruments found during the 19th century including the hammered dulcimer and violin. This will be an emotional and moving evening evoking the celebration of election and battlefield victories, tempered by the terrible losses to the nation, families and soldiers. A night not to be missed! 7 pm; Main Branch of the Library. Free. Reservations Recommended. RESERVE YOUR TICKETS NOW. Refreshments Follow. This summer we will be taking a break from our programs but we will be at the Hunterdon County 4H and Agricultural Fair in the Community Tent from Wednesday August 23 through Sunday, August 27th and also at most of the summer Concerts Under the Stars music series offered by the Hunterdon Parks Department on Thursdays from the end of June through August. Look for us there for our great fundraising items -- they all make great gifts! FROM THE READINGTON MUSEUMS: The Readington Museums is pleased to announce the return of Monday Mornings at the Museum, a hands-on summer program for kids ages 5-12. The sessions will be held on three consecutive Mondays – July 10, 17, and 24 from 10:00 a.m. to 12:00 p.m. at the Bouman-Stickney Farmstead, 114 Dreahook Road in the Stanton section of Readington Township. At each session, the children will have a short history lesson followed by a hands on project, with a new theme offered each Monday. Programs include candle making, tin punch designs, butter making, and learning an English country dance. The cost of each session is $5.00. Preregistration and payment prior to each session is required. Visit registration online through the link on their homepage: www.ReadingtonMuseums.org, or contact the Readington Museums at 908-236-2327 or readingtonmuseums@gmail.com. Please mail checks payable to Readington Township to the Readington Museums, PO Box 216 Stanton, NJ 08885. June 30, Friday “The Forgotten Village: Stories and Genealogy of Stanton NJ”, Mike Alfano Mike Alfano will discuss his research about the genealogy and history of the Dutch and German settlers of Stanton and Pleasant Run, as well as the history of their surnames, and their land records. In addition to this research, Alfano has found a passion in researching Hunterdon Militia in the Revolutionary War - in particular, the 4th Regiment which was comprised of Readington, Lebanon and Tewksbury. A recent discovery, from the pension papers of local soldiers, was the fact that there was a skirmish near the Readington Meeting House in Dec. of 1776. Alfano is a retired software developer and has lived in Stanton for almost 25 years. He is the State Registrar, Sons of the Revolution State Librarian, Sons of the American Revolution Board Member, Somerset County Historical Society Volunteer, Hunterdon County Historical Society Past Board Member, New Jersey Society of Mayflower Descendants Interim President, Daniel Bray (Hunterdon) Chapter, Sons of the Revolution Vice President, and Westfield Chapter, Sons of the American Revolution. 7 to 8:30 pm at the Bouman-Stickney Farmstead. $5 per person suggested donation. Visit registration online through the link on their homepage: www.ReadingtonMuseums.org, or contact the Readington Museums at 908-236-2327 or readingtonmuseums@gmail.com. July 21, Friday “Art in Food and Food in Art”, A lusciously illustrated PowerPoint talk with Peter Rose on food and drink seen in the seventeenth century Dutch Masters and their relevance to the American kitchen today: it explores the food ways brought to America by the Dutch more than three centuries ago and how these foods were changed and adapted under the new circumstances. Using slides of some 40 paintings by Jan Steen, Adriaen van Ostade, Jan Davidsz. De Heem, Pieter Claesz, Harmen van Steenwijck and many others, the lecture will demonstrate how these art works give an insight in 17th - century food practices and shed new light on the colonial diet. Author/Food Historian Peter G. Rose has published nine books and numerous articles on Dutch food ways and the influence of the Dutch on the American kitchen. She lectures extensively on the subject nationally and internationally. Venues for her talks have included the Smithsonian Institute, the National Gallery of Art and the Mauritshuis in The Hague in the Netherlands. She is the recipient of the 2002 Alice P. Kenney Award for research and writing on the food customs and diet of the Dutch settlers in New Netherland. For more information, please visit her website: www.peterrose.com. 7 to 8:30 pm at the Bouman-Stickney Farmstead. $5 per person suggested donation. Visit registration online through the link on their homepage: www.ReadingtonMuseums.org, or contact the Readington Museums at 908-236-2327 or readingtonmuseums@gmail.com. August 18, Friday “NJ Diners”, Michael Gabriele “The History of Diners in New Jersey,” written by New Jersey author and historian Michael Gabriele and published in 2013 by The History Press, tells the story of New Jersey’s diner business and the evolution of the American diner phenomenon. New Jersey is universally recognized as the “Diner Capital of the World.” Friendly, familiar beacons on the Garden State’s highways, byways and downtown business districts, diners play an important role in New Jersey’s culture and community life, and serve as the ultimate egalitarian dining experience. Gabriele’s book gathers important pieces of the historical puzzle (people, events, places, dates, facts and figures) and assembles them into a cohesive narrative that traces New Jersey’s diner history. Along with tales of noteworthy diners of the past and present, the book pays tribute to New Jersey as the diner manufacturing capital of the world during the 20th century. This was the period when diners were designed and built in factories as engineered products—much like cars and planes. The Garden State was the production hub that built thousands of diners during the 20th century—the distinctive, streamlined, stainless steel gems that are admired around the world and recognized as iconic examples of American industrial design. More than just roadside attractions that serve coffee, pie, hamburgers and French fries, diners are a vibrant part of the state’s culture, history, commerce and mythology. Many classic, factory-built, stainless steel diners have survived and continue to operate throughout New Jersey as landmarks and architecturally significant structures in the state’s “built landscape.” A lifetime Garden State resident, Gabriele has written three books on New Jersey history. The most recent book, “New Jersey Folk Revival Music,” was released in December 2016. The first book, “The Golden Age of Bicycle Racing in New Jersey,” was published in 2011. Gabriele has been a journalist for more than four decades. 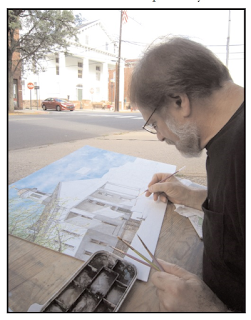 He is a 1975 graduate of Montclair State University; a member of the executive board of the Nutley Historical Society; and serves on the advisory board of the Clifton Arts Center. 7 to 8:30 pm at the Bouman-Stickney Farmstead. $5 per person suggested donation. Visit registration online through the link on their homepage: www.ReadingtonMuseums.org, or contact the Readington Museums at 908-236-2327 or readingtonmuseums@gmail.com. July 9th: Come celebrate Hunterdon County's rich cultural and agricultural history at the Hunterdon Land Trust Farmers' Market at the Dvoor Farm, 111 Mine St. in Raritan Township on Sunday, July 9 from 9 a.m. to 1 p.m. The day will feature historical presentations, a tour of the 19th- and early 20th-century Dvoor Farm barns with architect Chris Pickell, and a tour of the 1798 Dvoor Farm House. Several local history organizations will also also attend the market. The Farmers' Market features more than 20 local farmers and vendors offering fresh, organic fruits and vegetables, grass-fed beef, chicken, pork, yak, bread, cheese, milk, eggs, flowers, freshly ground herbs and blended spices, honey, native plants. There's also live music, a flatbread truck making fresh pizzas with farm-fresh ingredients, and prepared foods. The Red Mill Museum Village in Clinton proudly announces the opening of their new exhibit: Over Here, The New Jersey Homefront, which honors the 100th Anniversary of the United States’ entry in World War I. The exhibit specifically focuses on the effects of war on people’s lives here at home in New Jersey. Items from the Museum’s permanent collection will be on display, including a group of Liberty Loan posters that will be on view for the first time ever. They were donated by the late Helen Tomson of Clinton, whose father was Chester Tomson, owner of the Red Mill at the time of the war. Besides being a prominent business owner, Mr. Tomson was a two-time mayor of Clinton and a local Liberty Loan officer. Other items included are photographs, military memorabilia, military and Red Cross uniforms, children’s games and more, many on loan from local families. This multi-media exhibit opened last week and was met with rave reviews, one attendee announcing: "This exhibit is of New York Gallery quality." Visitors are invited to stop in the gift shop to purchase a poppy to place in our frame and turn the Mill red. Donated money collected from poppy sales benefit both the American Legion and the Red Mill’s education department. The Mill is open to the public Tuesdays-Fridays 10-4, Saturdays and Sundays 12-6. RED MILL MUSEUM VILLAGE TO HOST POPULAR GHOST & FOLKLORE TOURS: The popular Ghost & Folklore Tours are back! A job in a 19th century mill or quarry was dangerous work – sometimes accidents happened and people died. No one knows for certain, but many believe the buildings of the Red Mill Museum Village are haunted by spirits of those who labored here years ago. Many visitors, staff and volunteers have had experienced strange encounters they can’t explain. Join us for a special after-hours tour in the dark to hear the stories of the ghosts that are said to inhabit our museum. Afterwards, enjoy a private viewing of some of the more macabre objects in the museum’s collection. Not recommended for young children - parental discretion strongly suggested. Cost is $15 for museum members and $20 for non-members. Space is limited, advance reservations required. Tour dates scheduled for June 10th and August 12th with tours at both 8:00pm and 9:30pm. For more information or to purchase tickets visit our website at www.theredmill.org/calendarofevents.